The Suburban Style Life: Jillian is Five Months Old! Jillian is Five Months Old! I can't believe my little sweetie is five months old! What an amazing month this has been. You have changed so much that I hope that I can remember all of it. Thank God for this blog, every time I start to write one of your monthly posts, I always go back and read the last one. It amazes me to read what you were accomplishing the month before and you have come so far even from just a month ago. As I am writing this, I am sitting in our bed and you are sleeping next to me. It is my day off and this is when we usually have our little morning naps together. I love bringing you back into bed with me after you are up for good in the morning. We usually get in an hour nap and I just love this time together. You always are so cute when you wake up. You have the biggest smile on your face when you realize that you woke up in Mommy and Daddy's bed. It's so funny how you too can tell that this is a special little treat for you. Sleep always seems to be a hot topic and it is no different this month! I have to give an update on the sleep! The past week, Jillian has slept through the night twice!!! I think we have finally turned a corner, this last week when you haven't slept through the night, you only have gotten up once to eat. It has been wonderful!!!! Up until just a week ago, you had still been getting up twice to eat and Mommy was oh, so tired. The morning after you had slept through the night I think I skipped all around the office with so much energy, I was such a different person!! A lot of Mom's talk about a "Four Month Wakeful" period and I even read an article about how babies don't sleep as well in the fourth month because they are going through a lot of changes. Looking back, you may have been affected by this too. Usually Mom's will complain about the four month wakeful period after their baby has already been sleeping through the night but since you were not sleeping through the night, I thought this was just how you were and just not a good sleeper. It seemed like as soon as the five month mark approached, your sleeping improved drastically. We shall call this the "Five Month Snooze." Let's hope this good streak continues! In addition to you sleeping so well lately, you are now a mover and a groover in your crib. I have found you in all sorts of different positions when you wake up in the morning. You even had yourself all turned around with your head at the foot of your crib and your feet at the head. I am not sure how you pulled that one off but I was certainly surprised to find you like that! I mostly now find either your feet hanging out of the rails of your crib or you have gotten yourself flat up against the rails. Who knows how far you would go if those crib rails weren't holding you in! You have also recently turned into a side sleeper. How did that happen? This is the same baby girl who was just weaned off the swaddle a month ago and any movement at all would have woken you up into a crying fit. I enjoy watching all of your new sleeping antics on the video monitor, it's much more entertaining than anything on TV! 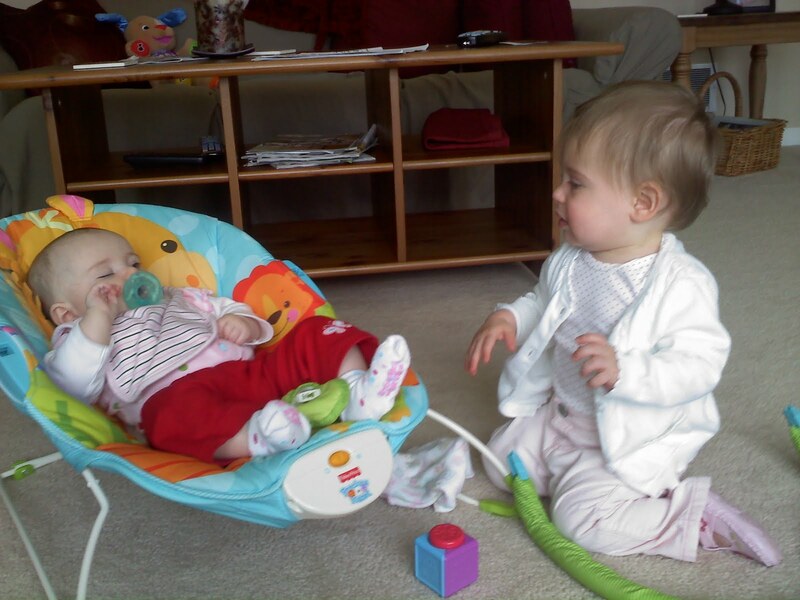 Jillian, you are in Carter's size six month clothing and are still just holding on to a size one diaper. I have twenty more left and I am trying to squeeze you into them. So far so good. You have worn size two diapers but I feel they are still just a tad bit too big. I have no idea how much you weigh since we haven't been to the doctor's in a month. However, that is a good thing! That means you were very healthy this month!!!! You are still slightly teething but I am yet to see the signs of a tooth. Your doctor mentioned at your last appointment that a tooth should be popping any week now by what she was feeling in your mouth. You still drool on occasion and like to stick things in your mouth. You have been as happy as can be so I do not feel like they are bothering you yet even if they are about to pop. You are doing so much better at tummy time and you have started to roll from your tummy to your back. You are just so cute when you do this. I personally thing that this is your way of protesting tummy time so by rolling over to your back, it's like you are saying "OK, I have had enough of this!" You haven't figured out how to roll yet from your back to your belly but I know you have been practicing in your crib!!! I have a feeling that we are only days away from this milestone. Daddy put together your jumperoo a few weeks ago and you still trying to get the hang of it. Your legs are still short and don't touch the ground yet so we have stacked a blanket under your feet. You are not bouncing in it just yet, but are completely fascinated by all of the lights and music. You also like to touch all of the toys but haven't figured out yet how a lot of them work. I think you like it because you are able to stand upright and look out at everything. 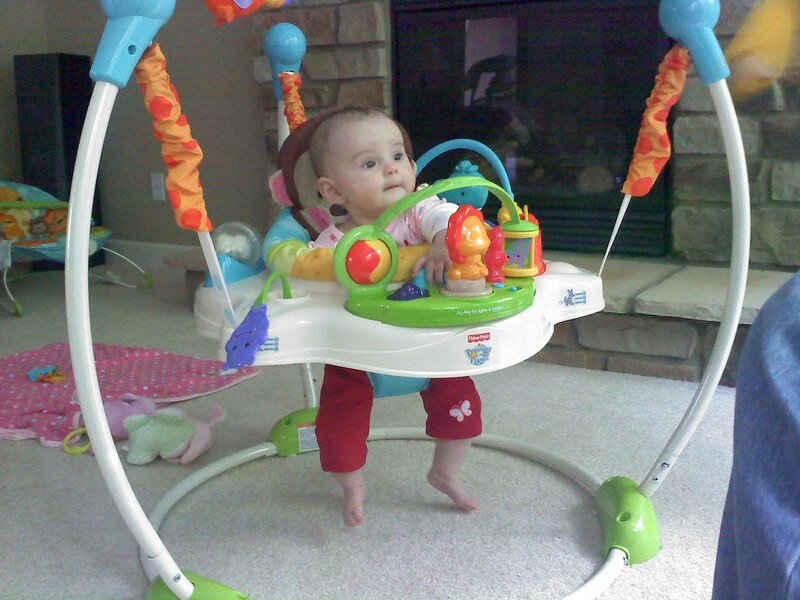 Your first time in your jumperoo. The look on your face is priceless! You had no idea what we had just put you in. You have been doing so well at daycare lately. You are finally starting to sleep in their cribs at nap time. Why can't you sleep in your crib during nap time at home? I am sure this is partially my fault since your nap times on my days off seem to be in your car seat lately while I am running errands or taking you for a walk around the neighborhood. The weather has just been so beautiful lately that after a long winter, the last thing I want to do is stay inside!!! I did try to lay you down in your crib this past weekend for a nap after you fell asleep on the boppy but still got the same result. Eyes wide open as soon as you hit the mattress. We'll just keep practicing!! I also think that you have improved so much with tummy time lately is because the women at daycare have been so good with you in getting in a few rounds of tummy time a day. I am slowly finding out that there are several benefits to daycare. It's nice having other women care about you and who will work with you on your development. Your favorite toy is still your bouncy seat. You can really kick and fling yourself back in this thing now!!! You also grab all of the dangling toys with no problem and are constantly pulling at the middle toy that makes noise. I remember when you first pulled the middle toy it was such a huge accomplishment. Now that little Lion is constantly meowing and playing music. You also still love your activity mat. You can bat at those little toys now with such force. You are also beginning to scoot around a lot on your mat. You usually end up in a different position on your back than from where I placed you!! You are really starting to love your Fisher Price Puppy too. Your Grandma bought both you and your cousin Nicole one for Christmas but I haven't gotten it out until now because I thought you were still to small for it. When we were over Nicole's house two weeks ago, you loved hers so I got yours out as soon as we got home. You now give Puppy the biggest smiles and you love to touch his fur. 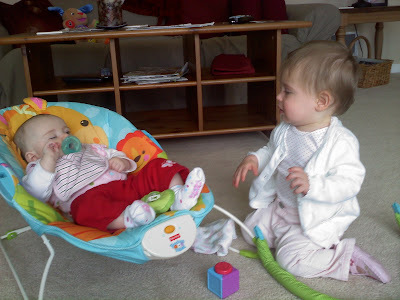 Mommy had fun watching you and cousin Nicole last week while Aunt Debbie ran a few errands. Nicole wanted to crawl into the bouncy seat with you!!! I feel like I have reached a new level of confidence as a Mom. I feel like I know now more than ever what you like and what you don't like. I can soothe you so easily now when you cry. Being a new Mom and hearing your newborn baby cry can be so stressful because you are so insecure and unsure about everything. Half the time I had no idea why you were crying. I am loving this new feeling of confidence and want a "do-over" of your first few months. I wish I could go back to the newborn stage knowing what I know now! I would also love to do it again NOT being so sleep deprived. I feel like I missed so much and sometimes didn't enjoy everything as I should of because I was so tired. I guess that all goes along with the territory of being a new Mom. I love you so much and can't believe that the next monthly post that I write is six months!!! I can't wait to see how much you change and grow. Happy 5 months Jillian! You are a lucky little girl to have your mommy, she's awesome! Ohhhh, I think the Jumperoo looks so much fun! We don't have one, but I'm keeping my eye out on Craigslist! So sweet! Jillian is growing soooo much! Here's to the 5 month snooze turning into the 6 month slumber :) And, I totally agree about the insecurities of being a new mom - it is so hard! It is really a time of adjustment trying to learn all about this new little person. Thankfully, they won't remember it like we will :) Happy 5 months to Jillian!! We have the same picky stickies.... sea horse.... and jumperoo!!!!!!!! Oh, Jillian's a doll! These are my favorite kinds of posts - I love reading what everybody's babies are learning to do; we get to watch them grow too :) I do this every month for my twins (they're 9months old), and always get such sweet comments. Thanks for swinging by my blog this morning - I hope to see you again! She is so cute!! I love the picky stickies and am excited to use them with E. :) I can totally identify with what you're saying about confidence as a mom. Yes, I'm only about 2 weeks into this, but I can see my confidence change with each day...which I had nowhere to go but up from the clueless stage...lol. :) Happy 5 months to Jillian! !